A tribute to Sushi the betta fish. 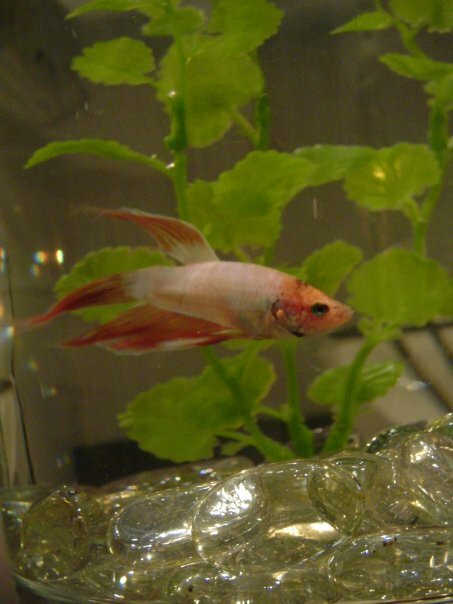 I had a pet betta fish named Sushi. I guess that’s not the best name for a pet fish. But he was white and orange, so I thought Sushi would be a cute name. We spent several happy months together. I would watch him swim happily up and down the fish bowl and eat heartily the food pellets I drop into the water. It was so delightful to watch his long flowy tail trailed behind him as he swam, and suddenly the hundred‐page spread sheet that I had to parse through didn’t seem so dreadful. Then he started eating less and less, and moving less and less. And then one day, he passed away. I’m not sure what went wrong. He was a good fish. 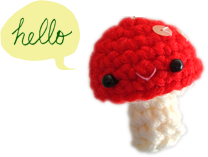 I had been wanting to try making things with plarn for a while (plarn = plastic bag yarn). But grocery stores here in Toronto no longer offer free bags so we always try to bring our own reusable ones. So I don’t have lots of plastic bags on hand; the only bags I have are those flimsy ones that come in rolls in the produce section. 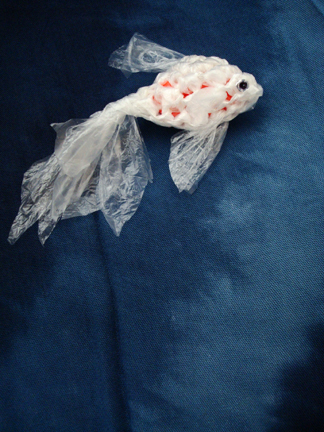 But then I thought the translucent quality of the produce bags might translate nicely into wings or fins — and Sushi the betta fish came to mind. 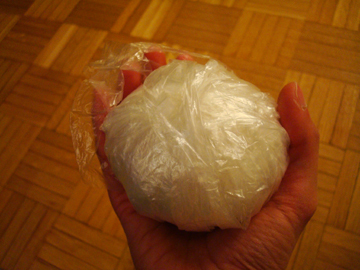 If you’re interested, here’s a handy instruction on how to turn plastic bags into knittable or crochetable plarn. And here is my ball of plarn. I forgot to count how many bags I used, but I think there were around 10… and some I could only use half of the bag because they had green writing printed on them. 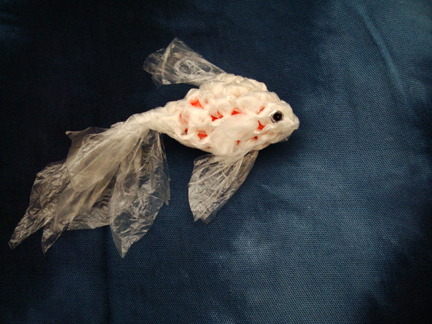 I stuffed the fish with a bit of an orange plastic bag, because Sushi the betta fish was orange and white. And I added bits of plarn with some white glue for the tail and fins. The plarn didn’t turn out as translucent as I thought after it was crocheted, but I liked that it has a pearly sheen to it. I then cut out a tiny circle from a silver Wonder Bread bag and drew on it with a Sharpie for the eye. Thank you for the inspiration, Sushi. You will always be remembered fondly. 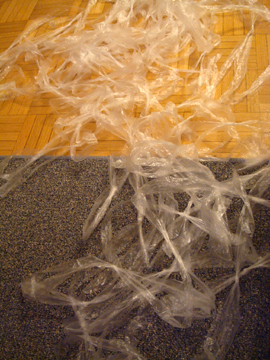 Its amazing how a need turns into something interesting, especially when you didn’t have plastic bags. That is a good idea!!! At my church we crochet milk bags to make mats for Country’s that need a bed (those of you who don’t live in Canada our milk comes in bags. 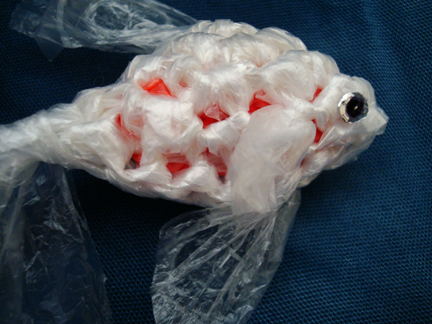 Do you know how to make more animals with plastic bags?? very cute…I’ve had Betta fish before…never once was clever enough to name it Sushi! Very well thought and made. Congratulations! Very cute! I have a white/red male and white iridescent purple female myself. Your plarn fish looks a bit more like a goldfish than a betta though. Still great! Can you please share the pattern? I’m not great at figuring it out just by looking. Thanks! !